Why Work With a CEA? Executors may turn to up to seventeen professions in the course of their duties, but no one profession understood everything the others do to help and guide executors, until now. 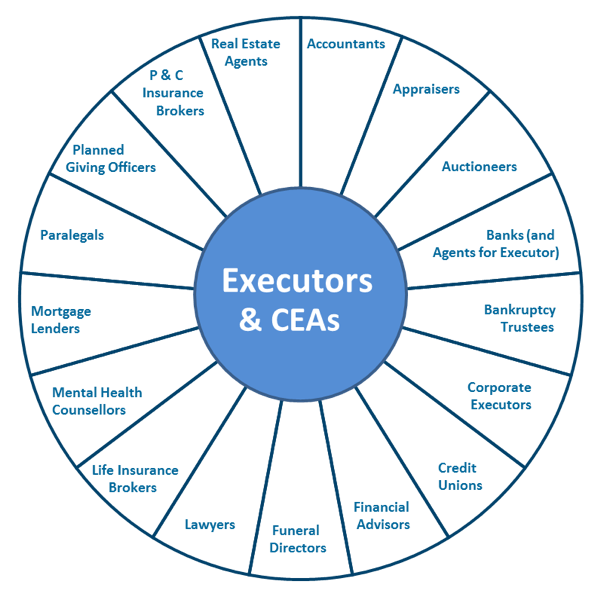 Certified Executor Advisors are experts in their own field but also have broad practical knowledge of everything the executor needs to know. They’re uniquely equipped to steer executors away from potential problems and toward the professionals they need. For testators wanting to ensure their estates are well prepared, so as not to be a burden on their executors, CEAs can offer tremendous value. They’ve seen what happens when estates aren’t properly prepared, and the fallout can be shocking. Estates can be frozen for years, sometimes decades, heirs can be disinherited, intended charitable bequests can be defeated, and families can be permanently ripped apart. Certified Executor Advisors can advise testators, executors and heirs, and they work hard to ensure successful transition from generation to generation, helping keep to Canadian families happy, healthy and harmonious. Which will be your legacy? To find CEAs across Canada, by core profession and/or by region, please consult the National Find a CEA Directory.